The Tohoku earthquake’s impact on GOCE (Credits: ESA). Coinciding with the two year anniversary of the Tohoku earthquake that hit Japan on March 11, 2011, sparking a tsunami that killed 20,000 people and causing a nuclear meltdown at the Fukushima-Daitchi nuclear plant, researchers have announced that the earthquake’s effects were felt all the way from space. “Seismologists are particularly excited by this discovery because they were virtually the only Earth scientists without a space-based instrument directly comparable to those deployed on the ground,” said Raphael Garcia from the Research Institute in Astrophysics and Planetology. A preliminary publication in Geophysical Research Lectures demonstrates that acoustic waves propagated 270 km above the earthquake. 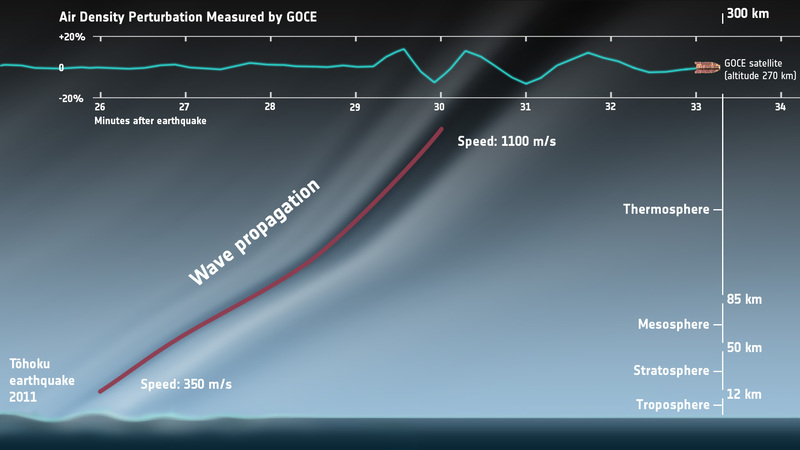 These waves altered the atmospheric density in that region and vertically disrupted ESA’s GOCE satellite. GOCE is a highly sensitive gravity-mapping satellite. It’s low-flying orbit is necessary to its mission, but requires highly accurate compensation for the relatively high atmospheric drag in that region. Very precise accelerometors take care of this compensation, and it is they that allowed scientists to infer atmospheric density values along its orbital trajectory.